Subtitle: In U.S. Army Intelligence, I was trained that the truth most often lies in the exact opposite direction of the public rhetoric. You must learn this technique if you are to successfully glean the truth from news reports. During the Vietnam War, I joined U.S. Army Intelligence, and was assigned to the Joint Intelligence Sobe Processing Center on Okinawa. This facility was so high level it was called "The Pentagon of the East". We sent finished intelligence data to the Pentagon inside of raw data. During this tour, I received much instruction and knowledge that has proven invaluable in this ministry. One fact I was taught was that, in order to arrive at the truth, one had to develop "Opposite Direction Thinking"; in other words, truth in many situations, especially strategic planning, was to be found in the opposite direction of the public rhetoric. During a build-up to war, for example, public rhetoric will speak of peace and treaties. A corollary to this dictum is that, when you see leaders who have obviously been building for war start talking peace, you know that the outbreak of war is probably imminent. Both High Contracting Parties obligate themselves to desist from any act of violence, any aggressive action, and any attack on each other, either individually or jointly with other powers." This Non-Agression Pact was signed in Moscow on August 23, 1939, between Ribbentrop of Germany and Molotov of the U.S.S.R. Even though other articles are included in this agreement, Article 1 succinctly captures the essence of the agreement. Both Germany and the U.S.S.R. pledged to each other and to the nations of the rest of the world that they were going to take all measures for the next 10 years to avoid conflict. "Peace in our time" never seemed so close to reality, and the naive amongst the population breathed a sigh of relief. This was the PUBLIC RHETORIC. Historians will tell you that the reality was actually found 180 degrees in the opposite direction. Hitler wanted this Non-Agression Treaty so he could pursue his goal of conquering Western Europe and England without having to worry about his eastern flank. Stalin, on the other hand, knew that Hitler would eventually attack the U.S.S.R., and wanted this treaty to give him more time to prepare for the war that he considered inevitable. With this treaty in hand, Hitler launched his planned World War II on September 1, 1939, attacking Poland. Hitler did not actually attack the U.S.S.R. until June 22, 1941, [http://fsmitha.com/h2/ch23.html] thus giving Stalin and his generals nearly 2 full years to prepare for the German onslaught they knew was coming. Hitler gained almost 2 full years to pursue his war to the West against Europe and Britain without having to worry about the Russians invading from the East. The truth of this matter lay completely in the opposite direction of the public rhetoric. As we stated, above, Hitler ordered the German High Command to attack Poland on September 1, just one week after he had concluded his Treaty of Non-Agression with Stalin. As the Poles were fighting vigorously against the Germans, the Russian Army suddenly attacked Poland on September 17, 1939, without warning or provocation. Fighting a war from both directions, Poland capitulated on October 2. While Hitler was attacking Poland, he directed his diplomatic efforts against Czechoslovakia. For months during the Spring and Summer, Hitler was demanding control over Czechoslovakia, to "protect" the German population that Hitler said was in danger. Czechoslovakia was a collection of several diverse groups of people, not the least of which were people of German descent. Once Hitler invaded Poland on 9/1/1939, Britain and France became very alarmed. British Prime Minister Chamberlain flew to Berchtesgaden, Germany, on September 15 to see if any hope for peace in Europe could yet be attained. Chamberlain was operating under the illusion that Britain, France, and Hitler's Germany shared a common enemy in Communism. Therefore, he tried to negotiate with Hitler to join their ranks to fight Communist Russia. Hitler, though, was miles ahead of Chamberlain in his strategic thinking. Chamberlain left the meeting in Munich on September 30, 1939, and flew back to England. As he arrived, he made his infamous statement, "I believe it is peace in our time." As this historian noted, "He was greeted with cheers and relief." [Ibid.] In other words, the naive public warmly and tightly embraced Chamberlain's delusion, even though other politicians like Churchill began to immediately warn the people not to be deceived! The reality lay exactly in the opposite direction of the public rhetoric. Hitler's historic example of this principle also gives rise to a corollary principle: when war preparations are evident and close to completion, leaders will suddenly start speaking peace. Therefore, one of the clearest indications that military action may be close is when politicians and military leaders -- who have been observed making detailed war preparations -- suddenly begin speaking peace. Keep this corollary in mind, as today's leaders from America to Israel are suddenly speaking peace when there is no peace on the horizon; therefore, we can conclude that perhaps military hostilities are imminent. During the first 4 years of quietly murdering people in individual hospitals, nursing homes, and mental institutions through a deliberate misuse of medical treatment, enough mistakes had been made that the word began to get out to certain learned German citizens and community leaders. Certain physicians began to speak out, but the greatest voice against this genocide came from Protestant church leaders. [The Nazi Doctors , Robert Jay Lifton, p. 90]. These voices of protest even learned that the secret name given to this genocidal project was the "T4 Program". As the voices of protest grew immensely, Nazi leaders became very concerned that the average German citizen would turn against them, thus making it impossible for all Jews and all devalued people to be eliminated as Hitler's satanic vision demanded. In fact, the Nazis even made a great show of taking apart the gas chambers it was using, convincing even more people that they were stopping the genocidal killing. However, Lifton noted that the Nazis quietly shipped these gas chamber parts to the East, where they set them up all over again, and planned the next and final phase of the killing. The reality lay exactly in the opposite direction of the public appearance. During the time of the ruthless Communist dictatorship in Russia, the savvy people collectively came to the conclusion that they could not believe a word of any part of the Mass Media, since censors controlled every sentence of every article. Over time, the knowledgeable Russian came to the conclusion that the truth of every issue actually lay in the exact opposite of what they were being told! 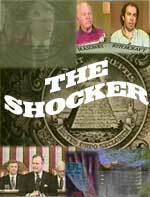 When the time arrived for the deliberate dissolution of the U.S.S.R., the people discovered that America was not the mortal enemy of the Russian people as they had been told for decades; but, the savvy Russian already knew this fact, because they had assumed the exact opposite of what the Mass Media had been telling him. The New World Order Plan to produce Antichrist likewise makes much use of this propaganda technique. In the events swirling around us right now, we cannot hope to comprehend the truth unless we adopt this strategic outlook on the Daily News and the regular administration rhetoric. Unless we train ourselves to look in exactly the opposite direction of what we are being told, we will never truly understand the events that are occurring. We have listed some current events in which the reality is 180 degrees in the opposite direction of the rhetoric of the Mass Media. We urge you to take this matter seriously, as the Madison Avenue propaganda is in full swing and is exceedingly effective. Example 1. President Bush: "We are not at war against Islam" -- The truth is that the Illuminati understood no later than the end of World War II that Islam was so strongly monotheistic that its followers could never, ever accept the claims of the New Age Christ. Therefore, they decided that all Muslim adherents [currently 1.2 billion] must die. We are seeing the outworkings of this plan now, amidst high-flying rhetoric that we are not at war against the vast majority of Muslims, but only against a "lunatic fringe". Muslims can never be a "proper receptor" to the New Age Christ so they must die [Read NEWS1052 for full discussion as to what a "proper receptor" is in the thinking of the Illuminati]. Also, please read Example 7 of the United Nations where this reality is demonstrated once again. Example 2. Islam is a peaceful religion -- In NEWS1556, we quote from the Koran to demonstrate that its teachings are not compatible with Christian teachings and that they really are the very opposite of what Jesus Christ taught. For example, the Koran tells Muslims: "8: 13. When thy Lord revealed to the angels, saying, `I am with you; so make firm those who believe. I will cast terror into the hearts of those who disbelieve. Smite them above their necks, and smite off all finger-tips.' "
Example 3. Setting Up The Palestinian State to Be Annihilated -- Remember our earlier comment that, when a leader is planning war, he speaks peace just before he launches the attack? This seems to be precisely what is occurring today between Israel, the United States and the Palestinians under the leadership of Yassir Arafat. The IDF has completed all the physical separation activities they need to ensure that, when the war of annihilation begins, no Jew will be in the target area. Today, Palestinian towns and villages are surrounded by fences, Jersey barriers, and/or anti-tank trenches. Today, the IDF controls the roads linking the cities. At a moment's notice, all Palestinian citizens could be locked down inside their villages, with the vast majority of the Jews kept out of harm's way. [Read NEWS1123, NEWS1422, and NEWS1241 for full details on the 2,500-year-old Obadiah prophecy that stipulates just such an attack at the End of the Age, during the 'Day of the Lord']. Therefore, we believe the annihilating attack on the Palestinians by the IDF is very close. Because of this belief, we find the following statements very interesting. Israel has no intention of giving Arafat his state, as he has proven his terrorist credentials exceedingly well the past decade generally, and during the past year of the current Intifada specifically. Every single cease-fire he has proclaimed has been destroyed by his own action. He has broken every single promise and commitment. Therefore, we must look for the truth in exactly the opposite direction: Sharon plans to carry out the action of complete annihilation planned since June, 1990 [Read full details in the articles quoted above]. October 1, 2001 -- President Bush declared that the United States had always planned on a Palestinian State. Of course, this is a huge lie. During the Carter and Reagan Administrations, the U.S. refused to meet with Arafat, because such meetings would confer upon him the title of Head of State; we stated the truth repeatedly, that Arafat was nothing more than a terrorist chieftain, not a legitimate head of state. Then, on December 13, 1988 , our Secretary of State suddenly announced that the U.S. would reverse that policy and begin meeting Arafat at a lower level. In the June, 1990, edition of The Jewish Press, I read the editorial which stated that top Israeli leadership -- both civilian and military -- had decided that, in the next Arab-Israeli war, they were going to annihilate the entire Arab states coming against them. Just two years later, in 1992 , the world heard of the "Oslo Peace Process", the negotiations for which were carried out secretly for over a year between Arafat and Shimon Peres. Since Arafat had openly backed Iraq during the 1990-1 Gulf War, he was ostracized by both the Western powers and Arab states. At the time Peres started meeting with him as though he were negotiating with a head of state, Arafat was literally "on the ropes" in his leadership of the PLO. Israeli and American intelligence services literally pulled Arafat off the canvas so he could begin "negotiating" with Peres to produce Oslo. Therefore, at no time in any Administration has it been the "plan" to allow a Palestinian State. Since this statement is so provably false, we must look for the truth in the opposite direction. October 1, 2001 -- Stories began to appear stating that America was reversing its policy towards Israel, and tilting toward Arab states [http://www.worldnetdaily.com/news/article.asp?ARTICLE_ID=24742, WorldNetDaily, 10/1/2001]. The editors of WorldNetDaily have obviously never read the Illuminati Plan to produce Antichrist and to build his temple on the Temple Mount in Jerusalem. New World Order author, Peter Lemesurier, states repeatedly that the New Age Christ will appear east of Jerusalem, enacting the "fulfillment" of Zechariah 9:9. [The Armageddon Script ]. The last one-third of Lemesurier's book is devoted to the plan to deceive the Jewish people into thinking he is their Messiah. Lemesurier speaks of the planned war to produce The New Age Christ, and foresees an Israeli victory. Further, Western Illuminized Freemasonry is totally behind this effort to produce Antichrist. Their most important ritual is the reenactment of the Legend of Hiram Abiff, in which three ruffians conspire to assault and to kill Hiram Abiff, King Solomon's chief architect of the Temple. Freemasons fully intend to rebuild the Jewish Temple, on the Temple Mount, in order to deceive the Jews into believing that their Christ is the long-awaited Jewish Messiah. Obviously, this cherished plan would fall apart should Israel be defeated by the Arabs, which would hand permanent control over the Temple Mount to the Muslims. Such a development would be considered an absolute disaster to the Illuminati, and they will prevent it from happening at all costs. Finally, God clearly states that, once He brings Israel back to the nation, He will never allow them to be thrown out of it again [Amos 9:11-15; Obadiah 17]. Since these statements make no sense, we must seek the truth in exactly the opposite direction. October 7, 2001 -- Israeli Prime Minster Sharon suddenly seemed to attack the Bush Administration policy of urging restraint toward Palestinian terror attacks. Sharon stated that Israel would defend itself, and would not allow America to wage its global war on terror at its expense. Immediately, the Bush White House responded negatively toward Sharon, leading many analysts wondering if a rift was developing between America and Israel. Since this development does not make sense, we need to look in exactly the opposite direction. If Israel is about to attack the Palestinians, America might want to be able to say that she had nothing to do with the attack, and deplores it. Bush could point to the "rift" that suddenly burgeoned between the two countries, and plausibly deny American knowledge or participation. Example 4. War Is Not To Begin Anytime Soon -- This headline graced many of the nation's newspapers and TV reports on Saturday, October 6. On Sunday, October 7, President Bush ordered the attack to begin. A review of articles and editorials on Sunday, the 7th, revealed a sudden surge in the talk of war, even though President Bush had not yet publicly revealed that he had ordered the attack when the newspapers went to press. Example 5. Former Pennsylvania Governor, Tom Ridge, has stated "we must also reject the false choice of liberty versus security ... We can and must have both. We will be safe. And we will not let the terrorists change our essential way of life." ["Ridge Vows Balance of Rights, Security" , The News-Item Newspaper, by Peter Jackson, Associated Press Writer, October 3, 2001. (7). For what purpose then have we invented this whole policy ..." [Protocols of the Learned Elders of Zion, PROTOCOL 11 -- THE TOTALITARIAN STATE; The Protocols were written about 200 years ago]. Notice they stated in paragraph 7 that they "invented this whole policy". Further, in paragraph 5, they state that they shall promise the people their liberties back as soon as they have "quelled the enemies of peace and tamed all parties". Now, how did these Illuminist leaders know, 200 years ago, that liberties would be taken away using the ruse of war and disturbance? The simple answer is that these Illumined Ones have planned from the beginning to first create the disaster and then step in with the "solution" that will enable them to become the dictators over the populace of the entire world. To thoroughly grasp the full impact of this statement from William Cooper, take a One Dollar U.S. Bill out of your pocket and turn it over on the back. On the left hand side, you will see the Egyptian Mysteries/Masonic symbol of the pyramid with the unfinished top, with the Eye of Horus -- Lucifer -- at the top within a triangle. 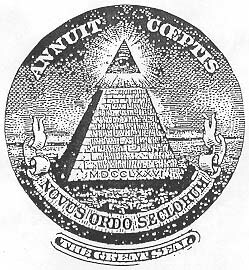 At the bottom of the pyramid is a ribbon with the following Latin words inscribed on it: NOVUS ORDO SECLORUM. Translated, this means, "New World Order". The New World Order is nothing more, nor less, than the Kingdom of Antichrist established on earth. Since this One Dollar Bill is official United States Government currency, you know that this symbol is an official United States Government symbol. Thus, you know that our Federal Government has been officially committed to this New World Order since 1776, which is the year translated from the Roman Numerals at the bottom layer of bricks on the pyramid. [We explain this concept fully in Seminar 2, America Determines The True Flow of History ]. When either the President, or the Director of Homeland Security, or the head of FEMA [Federal Emergency Management Agency] tells an incredibly frightened citizenry that he must "temporarily" take away their freedoms, remember this plan of The Protocols , contrasting it with the original statement by Tom Ridge. When Mr. Ridge said we would not allow the terrorists to change our way of life and make us lose our liberties, the reality lies in the exact opposite end of the spectrum. When we attempt to accomplish this goal by striking at terrorist camps in countries other than Afghanistan, we shall likely provoke such a counterattack from the Arabs that will start the conflagration of the planned Third World War. This Muslim counterattack may be both in domestic terrorism and armies on the march in the Middle East. The reality of Osama bin Laden lies in the opposite direction. Osama bin Laden is simply an employee of the worldwide Illuminati as the bold occult signature of the September 11 attacks on the World Trade Center and the Pentagon demonstrate [Read NEWS1533, NEWS1538, and NEWS1541 for full details on this signature of '11']. Example 7. The United Nations is the global organization that offers the best hope of Peace and Safety -- Presidents Bush [Senior], Clinton, and Bush [Junior] have all repeatedly stated that the best hope of peace and safety in the world resides in the United Nations. During the aftermath of the Iraqi invasion of Kuwait, President Bush [Senior] repeatedly stated that this invasion might just allow the United Nations to finally fulfill its original wonderful vision when the institution was founded after World War II. However, the United Nations was originally founded for the sole purpose to be the government of The New Age Christ, whom the Bible calls Antichrist. Listen to the demonic Guiding Spirit, Master D.K., speaking through Alice Bailey, in her monumentally important book, The Externalisation of the Hierarchy. Please note several facts about this most important paragraph: 1). The U.N. was established according to "spiritual values"; however, they are not the spiritual values based upon the Judeo-Christian Holy Bible, but upon the Buddha and the revived ancient Babylonian Mysteries Christ [Antichrist]. 2). Every person MUST assume these "constructive" attitudes; while no punishment is mentioned for those who refuse to adopt these "constructive" attitudes, we shall quickly find out what they are. 3). Since the Muslims will never, ever accept the Polytheism inherent in Buddhism and the Ancient Babylonian Mysteries of Antichrist, they are planned for absolute annihilation. Keep this fact in mind as you watch events in the Middle East unfold. The Hierarchy is comprised of various high-ranking demonic entities working directly to produce Antichrist. Therefore, you can understand that every key leader of the United Nations has been carefully chosen and set in positions of power by the demonic host. Further, The Christ [Antichrist] has been personally leading the United Nations since 1945! THIS is the United Nations to whom Presidents Bush, Clinton, and Bush are so enthusiastically surrendering our national sovereignty. 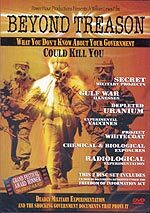 If you are not aware that President Bush has officially placed his foundation authority to wage war on terrorism, you need only to read NEWS1551. The reality of the United Nations lies in the exact opposite direction of the public rhetoric and the official policy of the Bush Administration. Jesus warned us that the hallmark characteristic of the coming Kingdom of Antichrist would be unparalleled deception. Three times in Matthew 24, Jesus warned of deception. Then, in verse 24, He warned: "For false Christs and false prophets will arise, and they will show great signs and wonders, so as to deceive and lead astray, if possible, even the elect (God's chosen ones)." [Parallel Bible, KJV/Amplified Bible Commentary]. This unparalleled spiritual deception operated constantly throughout the entire 20th Century, as the demonic host gradually moved the world closer and closer to the time when enough people would be "proper receptors to The Christ" that he could arise. We are at this point right here and right now. God warned in Daniel 12:10 that, while the righteous would understand what is happening to them and in the world, "none of the wicked shall understand". Today, Born Again Christians whose antenna is up and sensitive to the fact that events are fulfilling Bible prophecy, are very well aware of what is happening and why. However, all people who are not in right standing with Jesus Christ by being Born Again through His blood sacrifice on Calvary, will never understand. As events begin to explode, and the world rushes headlong into the planned World War III that will allow Antichrist to arise, you need to adopt "Opposite Direction Thinking " skills. The Illuminist leadership has controlled the Mass Media all through the 20th Century and have an especially tight control over it today. What you are watching on TV, and reading in your newspapers is tightly controlled. When President Bush stated that much of this war on terrorism was going to be fought in secret, you know that tight censorship is invisibly in place. You must adopt "Opposite Direction Thinking" skills if you are to know what is really occurring or what is about to occur. Truly, the events of this day demonstrate that we are living in the Last Days. Are you spiritually ready? Is your family? Are you adequately protecting your loved ones? This is the reason for this ministry, to enable you to first understand the peril facing you, and then help you develop strategies to warn and protect your loved ones. Once you have been thoroughly trained, you can also use your knowledge as a means to open the door of discussion with an unsaved person. I have been able to use it many times, and have seen people come to Jesus Christ as a result. These perilous times are also a time when we can reach many souls for Jesus Christ, making an eternal difference.